Rick and Gail Australia 2010: HELLO FROM KADINA - OUR AUSTRALIAN HOME FOR ONE YEAR! HELLO FROM KADINA - OUR AUSTRALIAN HOME FOR ONE YEAR! We landed in Adelaide on January 8th thus embarking on our final leg to Kadina, South Australia where Gail is to commence her teacher exchange position for 2010. Jill, our “Exchange Buddy” met us at the airport at 8:30 AM when the temperature was already well on its way to +300C. Jill advised that we were in the middle of a heat wave and the temperature would reach +430C by about noon. She also noted that the weatherman had forecast that the next couple of days were going to be “stinkers”, an official Australian weather term. We marvelled as within a six week period we had gone from -400C to +400C. Talk about temperature extremes, yet ironically that are a lot of similarities; which we will elaborate on in later blog entries. We first met Jill, our exchange buddy, while she and her son were on an earlier teacher exchange to Edmonton in 2003. Since then, Jill has had the good fortune to also go on another exchange to Japan in 2008. As part of the teacher exchange program, incoming teachers are matched up with an exchange buddy. The exchange buddy is assigned with the task of assisting the incoming teacher (i.e. ; Gail and by default Rick) to adapt to their new and unfamiliar surroundings. The fact that we have already met Jill in her previous life as a newbie exchange teacher while in Canada made our welcome in Australia a re-acquaintance with an old friend. Jill spent the day showing us around Adelaide taking us to the Botanical Gardens, touring Adelaide’s Torrens River Valley (similar to Edmonton’s North Saskatchewan River Valley) and visiting the Central Market. The Central Market is similar to Edmonton’s Strathcona Market only about 10 times larger. While at the Market, we had our first opportunity to sample, in order of tasting preference, Emu, Kangaroo, and Camel Sausages. As the temperature during the day rose to +43, Jill spent most of her day misting us both down with an atomizer so that we could stay cool in the unbearably dry hot environment. We found it to be quite humorous, a little embarrassing in being pampered; but most importantly, much appreciated. We also recognized that we were totally unprepared to handle such a HOT and dry climate. Plus 30 is one thing, but +40 is a furnace and something that we had not experienced. 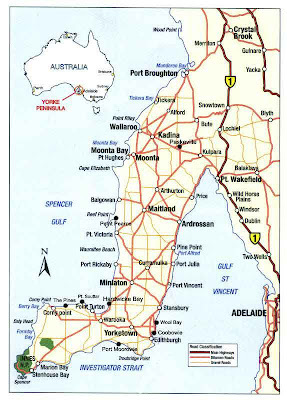 The next day, Jill drove us to Kadina, which is located approximately 1 ½ hour drive northwest of Adelaide (refer to Map insert). 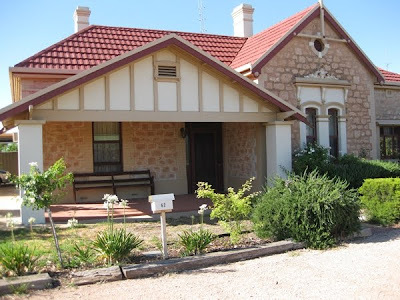 Kadina is a town of approximately 4,000 – 5,000 people situated on the Yorke Peninsula. The Yorke Peninsula is an amazing place that warrants a separate blog entry at a later date. As we left Adelaide towards Kadina, we drove through a flat landscape that reminded one of travelling through southern Saskatchewan. You could turn your head around 360 degrees and see nothing but flat. The difference being that the area was comprised of orchards, nurseries and hot houses, rather than miles and miles of wheat fields. Later we learned that this flat topographical area is the remnants of an inland sea that existed during the formation of the Australian continent. About half way to Kadina we started a gradual climb in elevation, and then steeper ascend, as we travelled onto the Yorke Peninsula. The Yorke Peninsula is a highly eroded plateau that was once part of an interior mountain range that rises out of the ocean in a west to east direction with the higher points of elevation being located along the eastern part of the peninsula. The peninsula is dominated by huge fields of cereal crops; with many of the fields being well over one section (1 square mile) in size. Given the heat of the day and the dry brown appearance of the vegetation, we found it hard to imagine that the area could produce a productive cereal crop. However, in realty, it is no different than one travelling through the Canadian prairies in winter. How can such a cold harsh climate be home to Canada’s bread basket? As we were driving to Kadina, we couldn’t help but notice a large 24” – 36” water supply pipeline following alongside the road. We have subsequently learned that this supply line is the predominant water source for people living on the northern part of the peninsula. (The southern portion of the peninsula’s water supply is provided by groundwater sources and a desalinization plant.) The line originates approximately 150 kilometres away in Australia’s largest river, the River Murray. Water is pumped from the river and conveyed through a series of pumping stations to a large reservoir just north of Kadina. The reservoir is covered to minimize evaporation. We have been in Kadina a week and already three or four residents have reminded us that we are living in the driest state in Australia, which is the driest continent on earth. Parts of South Australia have just come through a 10 – 12 year drought and they are not sure if the water shortage crisis is over or here to stay due to climate change. Water is a precious commodity that everyone is alert to, and has an opinion about. We will elaborate more about water issues in a separate blog. Kadina reminds us of any small Canadian agricultural town of a similar size located on the prairies. The town is the major agricultural hub for the area having a John Deere tractor dealership, fertilizer supply outlet, state government agencies and numerous other service providers for the agricultural industry. We are fortunate enough to be living in one of the many original older homes in the town. Our house was built around the turn of the century with an addition added on around 1930 – 1940. These homes are something with which we have no familiarity. For example, the walls of the homes are typically 12-18 inches in thickness, are constructed of stone/rock, have slate or steel roofs with each room typically having 12 – 14 foot ceiling heights and a fireplace. Full length-size verandas are a standard feature and the houses are, where possible, aligned in a north-south exposure. They have been designed and constructed so as to minimize the unbearable heat in the summer and cold in winter. Given the thickness of the walls, it will take the house three or four days to absorb the full effect of +43oC temperatures. If the heat wave lasts longer than that, the heat is absorbed into the rock walls, turning the house into an inferno. When that happens, everyone closes all the doors to each room and camps out only in those rooms equipped with air conditioners. It is our understanding that the newer homes are of wood construction, well insulated and covered with a facade of rock/brick. The ceilings are typically 9 feet in height and air conditioners are sized to cool the house. Once we have the opportunity to visit someone living in the newer homes, it will be interesting to see and compare the differences between new and old house construction methods. In our first week at Kadina, we have purchased a vehicle, travelled to the Clare Valley for some wine tasting and toured the entire length of the Yorke Peninsula. 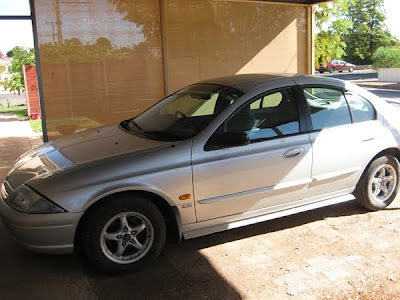 We purchased a 1999 Ford Falcon with 170,000 km for $7,000 AUS $. Our impression is that cars are considerably more expensive to purchase here than in Canada. We were looking for a vehicle which was dependable and would get us from A to B and would hopefully not depreciate much over the course of one year. If we paid more for a newer vehicle, we think we would have loss on the depreciation when it came time to sell the car at the end of the year. If we went with a cheaper car, we think that we would be paying for repairs and see ourselves stranded on the road somewhere. Only time will tell if our expectations come true or not. Most homes don’t have dryers but when it’s +40 out, clothes only take about 45 minutes to dry on the line. We have both an orange and a lemon tree in our yard. Photos will come once the fruit is ripe. You’re only allowed to water your lawn or garden twice a week but you have to stand and hold the hose – no sprinkler systems are allowed. Time allotment to water is between 6-9 PM only. We have become very aware of our water usage and have a gray water container in our sink at all times as you’re allowed to throw water from a bucket on your yard at any time as many times as you wish. Parents with smart girls (or boys, but especially girls) who can afford the expense send their kids to private boarding schools as early as grade 8 to complete their education. They feel that their kids will get a more rounded education with fewer distractions. Some of the parents are child free as soon as their youngest reaches 12! This is a difficult decision for both parent and child. Groceries, on average, cost more, but it is such a treat to have fresh fruit and vegetables. We bought cherries today- January 19th and we have been getting our fill of fresh watermelon. We’ve had marinated kangaroo steaks on the barby. They are almost fat free and very high in iron. They have a texture similar to liver only with more fibre. We’ve yet to see one bouncing out in nature though. Closest we have come to seeing one is road kill. We will keep you posted. We have seen Emu’s in the wild as well as a “Shingle-back lizard”. Pictures will be provided in our blog entry for the Yorke Peninsula. We’re giving ourselves until Feb. 1 to STOP turning on the windshield wipers instead of the turn indicator. The car is left-hand drive and everything is reversed in the automobile. No doubt the locals think it hilarious to see the wipers turned on at every corner given that there isn't a cloud in the sky. We will send you a separate blog entry about driving on the “Other side of the Road”. Toilets have a ½ flush option. If you go big, you can flush big, if you don’t go big you don’t have to flush big. We are really enjoying the southern sky at night. Because we are in a small town there is limited light pollution to mask the stars. The Milky Way is something else to see. We haven't found the Southern Cross constellation yet as it is apparently quite low in the sky at this time of year. As you can see, we have a number of blog entries to work on. More on our travels in the Yorke Peninsula and daily living in Kadina in a later blog.